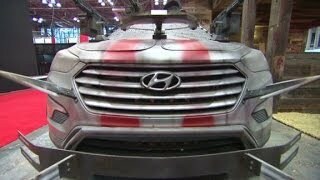 Hyundai has unveiled the Santa Fe Zombie Survival Machine which will make its debut at the New York Comic-Con on October 10th. 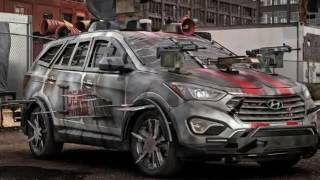 The Santa Fe Zombie Survival Machine, the newest addition to Hyundai’s zombie-fighting family, was created by Anson Kuo who used The Walking Dead Chop Shop configurator app. 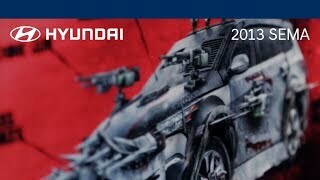 Kuo’s Santa Fe design was picked as the winner out of more than 82,500 fan submissions. His winning vehicle will be turned into a concept by Galpin Auto Sports (GAS). 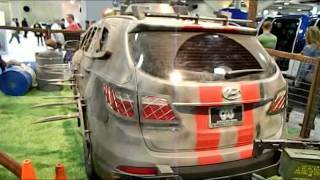 The Zombie Survival Machine features knife blades, an automatic crossbow, razor-wired windows, three machine guns, a samurai sword, aluminum armor and a muffler silencer.